Welcome to RouterTech - the site that gives you a free forum and FAQ based technical support for all things networking. We are completely independent and offer impartial advice. If you are looking for help with a problem with your router, home network or a place to ask about something technical you don't understand, you've found it! If you are new or have been away for a while, it is well worth familiarising yourself with the forum rules. Search the forums. We provide a comprehensive search function to ensure that if its on the forums it will be found. If you post a question we will assume you have failed to find it using the forum search. Search within a thread if you find a long one that could contain the answer you require but you cannot read it all. If you cannot find your answer by using these methods, it probably hasn't been asked before. Post up a new thread in the appropriate forum with a title that makes it clear what the question is about, and a user of the site or team member will try their best to help you. Which of these features are you happy to see removed from the firmwares for 2mb flash routers? Don't remove ANY of them - I really need all of them! Find our site helpful? Why not help us keep this site full of networking information and useful technical advice by buying an item or two from our shop. 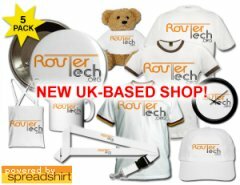 What could be better than a RouterTech mug or mouse mat on your desk to show your dedication to quality networking!